Speedrun.com Integration: Speedrun.com is fully integrated into LiveSplit. You can browse their leaderboards, download splits, and even submit your own runs directly from LiveSplit. You can also show the World Records for the games you run with the World Record Component. Accurate Timing: LiveSplit automatically synchronizes with an atomic clock over the Internet to estimate inaccuracies of the local timer in the PC. LiveSplit’s timer automatically adjusts the local timer to fix those inaccuracies. Video Component: With the Video Component, you can play a video from a local file alongside your run. The video will start when you start your run and stop whenever you reset. You can also specify at what point the video should start at. SpeedRunsLive Racing: In LiveSplit, you are able to start and join races on SpeedRunsLive within LiveSplit itself. The timer automatically starts when the race begins and automatically writes .done whenever you complete the race. Also, you are able to compare your current run with the other runners during the race, as long as they use LiveSplit as well. 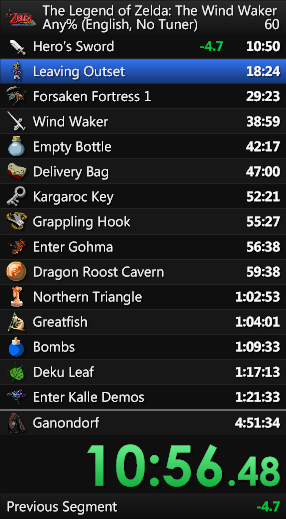 Comparisons: In LiveSplit, you are able to dynamically switch between multiple comparisons, even mid-run. You can either compare your run to comparisons that you define yourself or compare it to multiple automatically generated comparisons, like your Sum of Best Segments or your average run. While racing on SpeedRunsLive, comparisons for the other runners are automatically generated as well. Layout System: Users can modify every part of LiveSplit’s appearance using Layouts. Every user has the ability to add or remove parts along with being able to rearrange and customize each part of LiveSplit. You can even use your own background images. Dynamic Resizing: LiveSplit can be resized to any size so that it looks good on stream. As LiveSplit’s size is changed, all of its parts are automatically scaled up in order to preserve its appearance. Sharing Runs: Any run can be shared to websites such as Speedrun.com and Twitter. Splits can also be distributed using Splits i/o and imported from a URL. You can also share a screenshot of your splits to Imgur or save it as a file. Your Twitch title can be updated as well based on the game you are playing. Component Development: Anyone can develop their own components that can easily be shared and used with LiveSplit. Additional downloadable components can be found in the Components Section.